Hello! Happy Tuesday and thank you for stopping by, I'm so glad you're here! 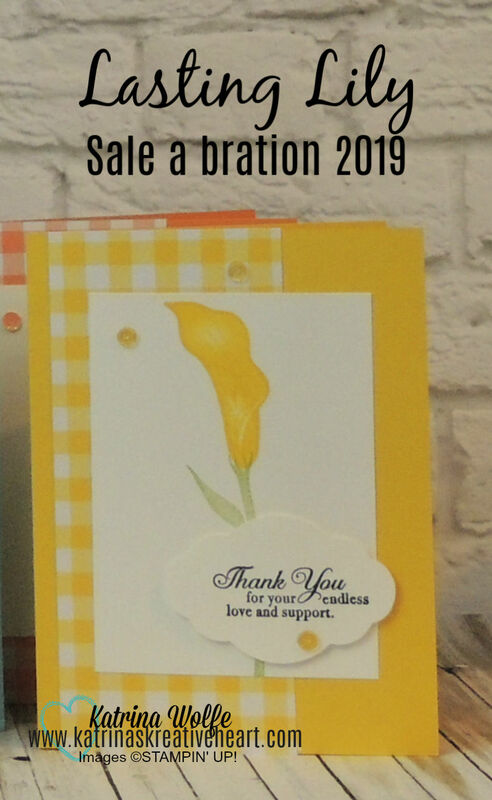 Today, I want to share my thank you cards going out to all of my customers that placed an order with me in the month of January. 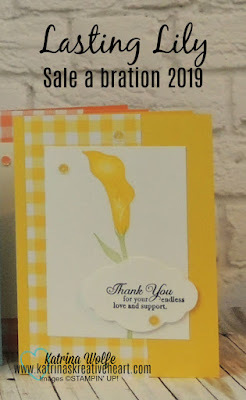 It's using one of my favorite Saleabration stamp sets, Lasting Lily. This set has some amazing sentiments making it perfect for so many occasions and the only way to get this set is to place a minimum $100 order as it is a level 2 Saleabration set. And boy is it worth it! To create these cards, I chose colors from the Gingham Gala designer series paper stack and cut my card bases from the coordinating cardstock 8 1/2" x 5 1/2" scored and folded at 4 1/4". I then cut the DSP 2 1/2" x 5 1/2" and adhered to the left side of the card base. 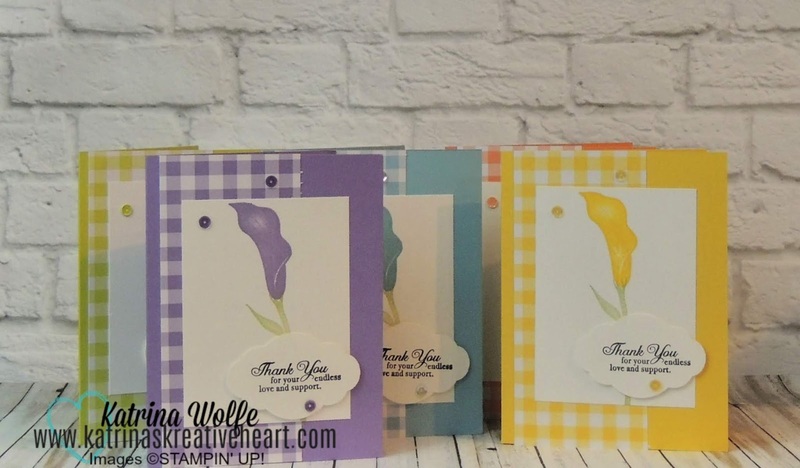 I then cut the Whisper White panel 3" x 4" and stamped the smallest lily in the coordinating ink colors and the stems in Pear Pizzaz. I then stamped the sentiment onto scrap Whisper White using Memento Tuxedo Black ink and punched it out using the Pretty Label punch and attached to the card with Stampin' Dimensionals. I then added a few of the coordinating Gingham Gala Adhesive Backed Sequins to complete the card. The colors used are Daffodil Delight, Highland Heather, Balmy Blue, Lemon Lime Twist, and Grapefruit Grove. I love these colors and I love how these cards turned out. I hope you enjoyed today's cards. Be sure to visit my YouTube channel and watch the short video I did for these and while you're there, subscribe to my channel. I would really appreciate it.